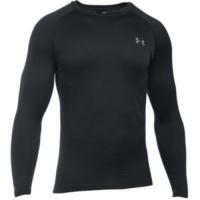 Under Armour has combined years of experience with the latest in heat-retention textile technology to create a comfortable base layer shirt for cold weather application. The Men's UA Base 2.0 Crew is a mid-weight performance shirt that traps body heat with an advanced negative grid interior in order to maximize warmth. Featuring four-way stretch fabrication, the shirt fits close to the skin while still allowing the full range of motion and unrestricted mobility needed to perform any number of physical activities. Under Armour's signature moisture transport system optimizes comfort for active users by wicking sweat away from the body for all-day dryness. Anti-odor technology fights odor-causing microbes and odiferous bacteria to keep users feeling as fresh as they look.